Some personality types pride themselves on having a clear head and rather focused sense of judgement. Everyone can have things that might cloud their judgement, but for some this is different than for others. 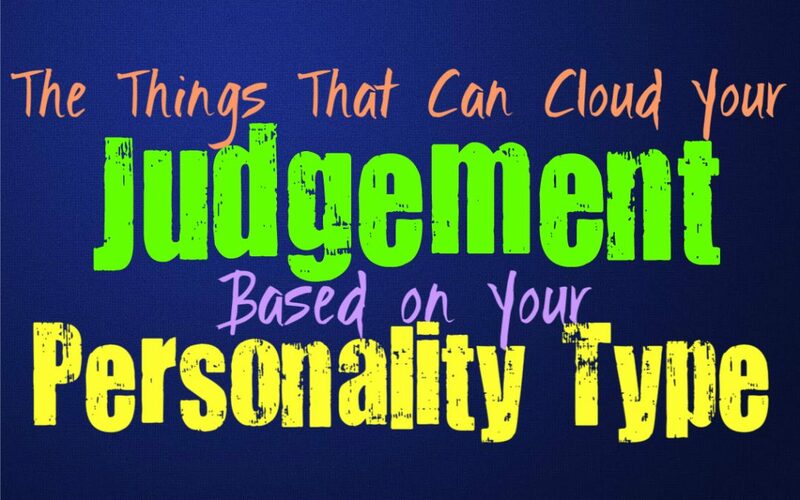 Here are some of the things that can cloud your judgement, based on your personality type. For the INFJ the thing that clouds their judgement more than anything, would be their feelings for others. They are intuitive people with a strong awareness of what is accurate and what is insincere. INFJs are also very capable of being logical and thinking with a mindset that is very focused. For the INFJ the cloudiest their mind will get, is when they are more focused on their feelings for someone. Caring about people often leaves them struggling to really see that person’s mistakes and can cause the INFJs judgement to be rather skewed. For ENFJs the biggest thing that will cloud their judgment is their feelings for those around them. They have big hearts and a strong desire to take care of others. Sometimes ENFJs can find themselves caring for people who can be a bit toxic or needy, and this can get them into a bit of trouble. They are normally intuitive people who have a strong grasp on the right choices to make, but their compassionate nature causes them to focus a bit too much on the needs of others. This definitely can cloud the judgement of the ENFJ, since their main focus is to take care of others. INFPs often rely on their emotions to make decisions, but that doesn’t mean it clouds their judgement. They focus on their morals and beliefs to do what feels right for them, regardless of what other people might believe. The thing that can sometimes cloud the INFPs judgement is their feelings for another person. Their desire to feel connected and their love for someone might leave the INFP only seeing the good in that person. For the INFP sometimes overthinking things can cloud their judgement as well, since their strength actually lies in their intuition and this is something that comes naturally. For the ENFP the thing that can sometimes cloud their judgement is their desire to seek out new things. They might want to dive into something new and become antsy sitting still for too long. ENFPs can become a bit distracted because of this, and might find themselves abandoning things that are valuable for them. They can struggle to really focus on remaining in one place, and this might cloud their judgement and cause them to let go of things that they should be holding onto. INTJs usually pride themselves on having solid judgement and focus on their priorities. They are logical people who prefer to focus on facts, and often push aside emotions. INTJs truly don’t want their emotions to stand in the way, and so they work hard to assess things from a logical point of view. While this is something that helps INTJs remain focused and maintain a clear judgement, sometimes their pride can cause them to neglect their intuition. If they become too focused on proving themselves right, this is when the INTJ might have a hard time seeing things clearly. This is something that happens more often for younger INTJs than it does for the matured INTJ. ENTJs definitely work hard to remain logical and factual in their choices, and don’t want to have anything cloud their judgement. They are strong-willed people who do their best to observe situations with a sense of focus and clear-mindedness. While they are logical people, that doesn’t mean there aren’t things that can sometimes get in their way. ENTJs sometimes struggle when they are trying to prove themselves to someone they care for, and this can be the thing that clouds their judgement in life. INTPs are logical people who do their best to remain focused and really analyze information. They work hard to uncover the truth and don’t want to let emotions cloud their judgement in any way. While most of the time the INTP can keep emotions out of their decision making, there are times when it their overthinking can actually hinder them a bit. INTPs might analyze something to death and this can cause them to doubt their own decisions even when they are right. When the INTP stops trusting their intuition and focused too much on overthinking, they can actually let this cloud their judgement. ENTPs are logical and intuitive people, and this often helps them observe things in a more accurate manner. They also like to remain open-minded and always try to look at things from different angles. They pride themselves on having a clear judgement with most things, but like anyone there are times when this can become a bit cloudy. For the ENTP their defiant nature is often the thing that can cloud their judgement more than anything else. They are stubborn people, and in their desire to prove someone wrong they can become a bit clouded. ISTJs try to remain clear-headed and practical in all of their decisions, and so they don’t like allowing things like emotions to get in their way. Most of the time the ISTJ can remain focused and work hard to keep things clear. While they can often remain focused, sometimes their desire to focus on what they are comfortable with can be the exact thing that clouds their judgement. They can sometimes struggle with change or jumping into anything new, and sometimes this prevents them from seeing the better choice. ESTJs strive to be logical people and often pride themselves on being clear-headed and practical. While they are good at making decisions with a sense of good judgement, that doesn’t mean they don’t have moments of being a bit cloudy. For ESTJs the thing that can often cloud their judgement is their stubbornness and their desire to prove others wrong. They are strong-willed and while this is a good thing it can stand in their way sometimes. ESTJs also dislike too much change and newness, and sometimes this can cloud their judgement and prevent them from seeing the better path. For ISFJs the thing that is likely to cloud their judgement, is their love for those around them. The fact that they care about others is often their main focus in life. ISFJs just want to take care of their loved ones and do best to provide for them. They don’t intend to allow this to cloud their judgement, since they are naturally very practical people. For the ISFJ it is hard to be clear-minded when they are trying to take care of the people they love and do their best to please them. The thing that clouds the ESFJs judgement the most, is their compassion and empathy towards others. Sometimes their sensitive hearts can actually cloud their judgement when making a decision. ESFJs try to see the best in the people they love, and do whatever they can to please them. This strong desire to please definitely has a tendency to cloud their otherwise clear and practical judgement. ESFJs simply want to make others happy, and sometimes this can cause them to neglect their better judgement. ISTPs prefer to focus on facts and things that can be proven, which helps them keep a clear head most of the time. The one thing that can stand in their way and cloud their judgement a bit, is their desire to seek out excitement. Sometimes the ISTP can become so caught up in the moment and their desire to push themselves, that they might get a bit clouded. Their risk-taking behavior can get the ISTP into trouble sometimes, which definitely can be something that clouds their judgement. ESTPs try to focus on facts and strive to be level-headed people, but sometimes their love for someone can be their biggest downfall. ESTPs want to make their loved ones happy but sometimes they seek out people who can be a bit toxic for them. They aren’t always great at finding the right connections and sometimes this can really cloud their judgement. They don’t always recognize when the feeling of the chase, is actually someone who is not quite appreciating their efforts. ISFPs prefer to follow their hearts and do what feels right for them in the moment. They don’t like allowing anything to stand in the way of following their inner sense of morals. For ISFPs the thing that can sometimes stand in their way is their desire to seek out something new. They can become unhappy if they are too stagnant, and sometimes this causes the ISFP to let go of things that might have a bit more underneath the surface than what they notice. For the ESFP their desire to follow their emotions and live so much in the present, can sometimes cloud their judgement a bit. They might miss out on some of the things they should be doing, because they are more interested in soaking up their surroundings. ESFPs also can become a bit cloudy when their intuition gives them feelings that make the ESFP a bit paranoid. Most of the time they do best when following their hearts, but sometimes other things can stand in their way.